A somewhat variable evergreen shrub or small tree, up to 12m in the wild, with linear leaves to 6cm long in irregular rows with two pale bands beneath, separate male and female flowers and brown to purple drupe-like fruits to 2.5cm long. There are a number of garden forms. [RHSD, Hortus, HFSEA]. ‘The genus Cephalotaxus, as limited by Dr. Pilger in 1903 in the Pflanzenreich, includes six recent species inhabiting Eastern India, Burma, China and Japan. The form distinguished by Siebold and Zuccarini as C. pedunculata is considered by Pilger to be only a variety of C. drupacea, and wild specimens in the herbarium at Kew, which are intermediate in character between the two, appear to justify this conclusion. Cephalotaxus differs from the more nearly allied genera in having a pair of ovules on each scale, and Torreya nucifera, Sieb. and Zucc., the herbarium specimens of which are extremely like those of C. drupacea, may be most easily distinguished by its narrowly lanceolate leaves tapering more gradually towards the tip. The plant from which the figure now given has been prepared has long been in the collection at Kew. It is a spreading bush, now 10 ft. high and 15 ft. through, furnished to the ground with luxuriant dark green foliage. In its bolder leaves and larger fruits it provides an agreeable contrast with the common Yew, and is very well adapted for semi-shaded places in the garden or as part of the undergrowth in thin woodland. The fruits are not produced plentifully every year, but they usually occur in sufficient quantity to afford an adequate and convenient means of increase. Any good soil suits the species; the chief point to be kept in mind in its cultivation is that it loves abundant moisture.’ [BM t.8285/1909]. Henry [Elwes & Henry, Trees Gt. Brit. Irel. 6: 1471 (1912)] is of the opinion that C. pedunculata is probably a hybrid between C. drupacea and C. Fortuni Hook. If this should be the case, the binary name of the hybrid would be C. Harringtonia and C. drupacea should be restored to specific rank. The remarks by Rothert (in Ber.Deutsch. Bot. Ges. 17: 279, foot-note) on the leaf anatomy of C. Fortuni do not seem to bear out the possibility of hybridity. Though it is to be regretted that the nomenclatural type of this species is a plant of doubtful origin, and apparently known only in cultivation, the fact that "Harringtonia" is the oldest specific epithet leaves no choice but to accept it under Cephalotaxus as the correct binomial.’ [Journal of the Arnold Arboretum vol.22, p.569/1941]. Flora Japonica Siebold & Zuccarini t.132/1870. Introduced to Britain as Cephalotaxus pedunculata in 1837 and as Cephalotaxus drupacea in 1844 [JD]. 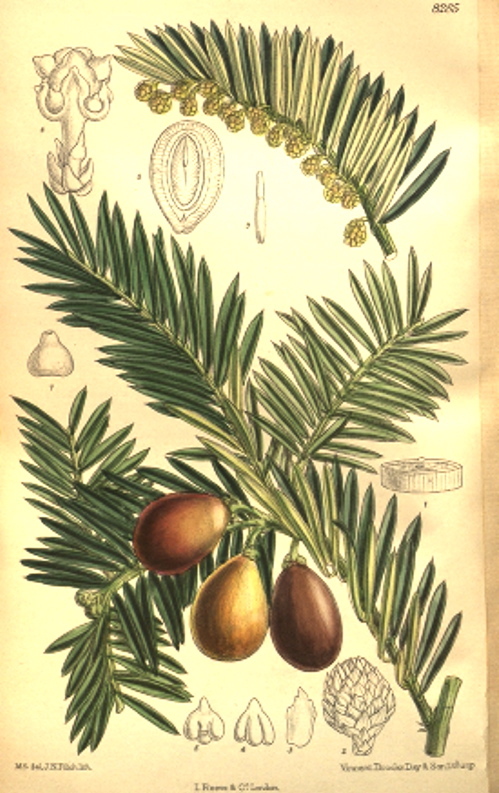 In a letter to Loddiges’ Nursery on 6th January 1845 Macarthur requested Taxus japonica [MP A2933-2, p.28]. I have found no further references and it may not have been grown in the gardens. See also Cryptomeria japonica D.Don. Taxus japonica Lodd. ex Gord. Cephalotaxus drupacea Siebold & Zucc. Cephalotaxus drupacea var. harringtonii (K.Koch) Pilg. Cephalotaxus drupacea var. pedunculata (Siebold & Zucc.) Miq. Cephalotaxus harringtonii (Knight ex Forbes) K.Koch var. drupacea (Siebold & Zucc.) Koidz.